Wonder Woman's desire to become a superhero takes her to Super Hero High, where she juggles new friendships, intensive training, and a roommate obsessed with social media. This was a cute story about DC superheroes as young teens. 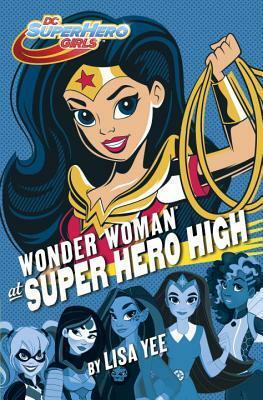 This book is part of a series, but the main superhero in this story is Wonder Woman. It follows her first year at Super Hero High, where young superheroes are taught how to use their powers effectively and for the greater good. I tagged this as middle-school, because that's how old I perceived these young supers to be, even though their school appears to be a high school. Part of what made this book a bit difficult to read as an adult is that they way the characters act seem very juvenile, certainly on the tween side. I thought the story was okay, though I struggled a bit to see Wonder Woman portrayed in such a naive way, despite her not having ever lived off of Paradise Island before. Much of what goes on the story focuses on her adapting to a new way of living, especially her interaction with her peers. The friction between her and the "villains" of this story is quite catty and, again, juvenile, but I can understand the reasoning behind this, since this book is geared toward someone much younger than me - I am not the target audience. That being said, the writing style is just so-so for me. It certainly didn't wow me. Otherwise, I think this is a fun, quick read for kids looking for a book that has a lot of action, especially if they're fans of superheroes. All the major DC characters are there to represent.